Okay, unlike most fans, I don’t care if a player signs with a ball point pen. It’s not really a big deal and as far as I know it could be a part of that player’s style. I know it technically ‘ruins’ the card, but I am just happy to get the autograph. The all time leading rusher at Kent State, (and MAC player of the year in 1987) Eric Wilkerson ran for 3,830 career yards (before the mark was broken in 1997). Wilkerson was a free agent signee by the Pittsburgh Steelers in 1989. Unable to crack the starting lineup he was out of football for the next season when he was drafted by the New York/ New Jersey Knights of the WLAF. The Knights under Mouse Davis were a Run and Shoot offense, where you pass first and run second. It became evident by week 2 though that Wilkerson was going to handle the load for the team as he rushed for 121 yards on 11 carries against future World Bowl Champion, the London Monarchs. Wilkerson in fact went on to lead the WLAF in 1991 with 717 rushing yards, placing him on the Second-Team All World League. He tied for the league lead in rushing touchdowns with 11, and second in total yards (990). He also was third in the league in rushing average, and had 3 touchdowns in one game against Orlando. His 4 touchdowns receiving topped the team as well. His Sophomore season would not be as spectacular as Reggie Slack emerged as a force at quarterback for the team. Wilkerson still finished 8th in the league in rushing with a respectable 4.4 yards per carry but the WLAF reorganized shortly thereafter and Eric became the short lived original league’s career leading rusher. His 72 yard scamper in 1991 would also stand as the league record. He’d play one final season of football for his hometown Cleveland Thunderbolts in the Arena leagues as a WR/DB and then retire. Since football, Wilkerson had his number retired at Kent State, and was inducted into the Varsity “K” Hall of Fame in 1995. He also was inducted into his local high school’s hall of fame at Central Catholic High. In 2007, Wilkerson was stabbed in the arm and was in critical condition, however there is no follow up information after this. His current whereabouts are unknown, but I was able to reach him a few years later via the Kent State Alumni Association. After not seeing much playing time in college at Arizona, and rushing for a minuscule amount of yards, Chris Henry declared as a junior- angering his coach who felt he could have benefited from another year before turning pro. Invited to the draft combine Henry would perform on the big stage and turned in scintillating numbers- some being better than fellow runningback Adrian Peterson, ranking in the top 5 in nearly every testable category. 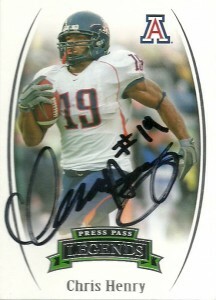 Henry shot up draft boards, and eventually was taken by the Tennessee Titans in the second round of the 2007 draft. He quickly garnered the ire of the league, and was suspended 4 games by the league for violating the NFL’s drug policy on prescription drugs. He’d finish the season with 119 yards and 2 touchdowns. In 2008, the Titans drafted Chris Johnson, and he would become the team’s marquee back. Henry would be be relegated to the bench, playing in only one game. He’d be released in September of 2009, but in October would be quickly signed by the Houston Texans, and assigned to their practice squad. By now Henry was considered a workout warrior, and a player who’s main knock was that his coaches could not teach him how to hit the correct holes or pick up blocks properly. Further it was charged that he did not study or apply himself properly, rather relying solely on his physical talent alone. He’d spend the season there, and in the next season found himself in the midst of a massive runningback competition between himself, Arian Foster, Ryan Moats, Jerimiah Johnson and Ben Tate. Tate early on was injured, and Moats was released, leaving a 3 way horse race. Foster by week 3 of the preseason nailed down the starting job, leaving Johnson and Chris to fight it out. Things were looking up for Chris and media reported that he was having a great camp. It got even more optimistic when Johnson who (was leading in the runningback competiton for the back up,) was injured. The next day- Henry was inexplicably released. The Texans reached out onto the waiver wire and signed veteran Giants/ Bucs runningback Derrick Ward. Chris Henry signed with the Seahawks, but was cut and resigned by the team shortly thereafter and as of this post is on their practice roster. Clayton Holmes’ story is a tragic and cautious tale. A 3rd round pick out of tiny Carson-Newman in 1992, Holmes went from rags to riches in the matter of days. (An amazing athlete, it was reputed that Holmes ran a 4.29 in the 40.) After an acceptable rookie season, where he was second on the team in special teams tackles and forced a fumble in the SuperBowl, it appeared that things were on the up and up for the young defensive back. Unfortunately, during the 1993 preseason, Clayton sustained a season ending injury and began to spend money and abuse drugs and alcohol at an unusual rate which led to him being suspended multiple times for weed. 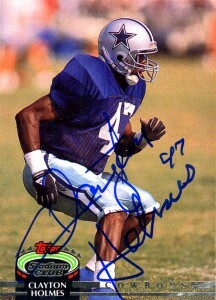 Holmes picked up some spot kick and punt return duty in his final two seasons with the Cowboys before his release in 1995. It is said that his multiple run ins with the league over his off the field problems coupled by his injuries led to Clayton’s release. He was contacted by his former coach Jimmy Johnson (who was now coaching in Miami) and asked Holmes if he was clean. Holmes, insisted he was and was signed by the Dolphins, but subsequently was suspended for a year for violating the league’s substance abuse policy. The Dolphins waived Clayton- without him ever playing a down for the team. Johnson stated openly that he worried about Clayton and his future. Holmes played some minor league indoor football for the Topeka Knights, and the Kansas Koyotes before finally retiring from football and dropping off the face of the Earth. In 1998 Clayton tragically tried to commit suicide, but in the end returned to his hometown of Florence, SC where he lived in a trailer with no running water or electricity behind his parents house. He has persevered since hitting rock bottom and has found peace. A deeply spiritual man, Clayton is currently an activist for Cannabis reform. 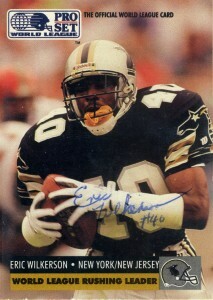 I got Clayton’s autograph in 1993, with the Cowboys at St. Edwards. He had a beaming smile and you could tell he was so happy to be there. Clayton was so full of life, and he couldn’t turn down an autograph request, signing as many as he could. He was a kid, and I felt in that brief moment we were much alike. It’s sad how far Holmes had fallen. I can not pass judgement so harshly on such a man and hope only for the best for Clayton Holmes.